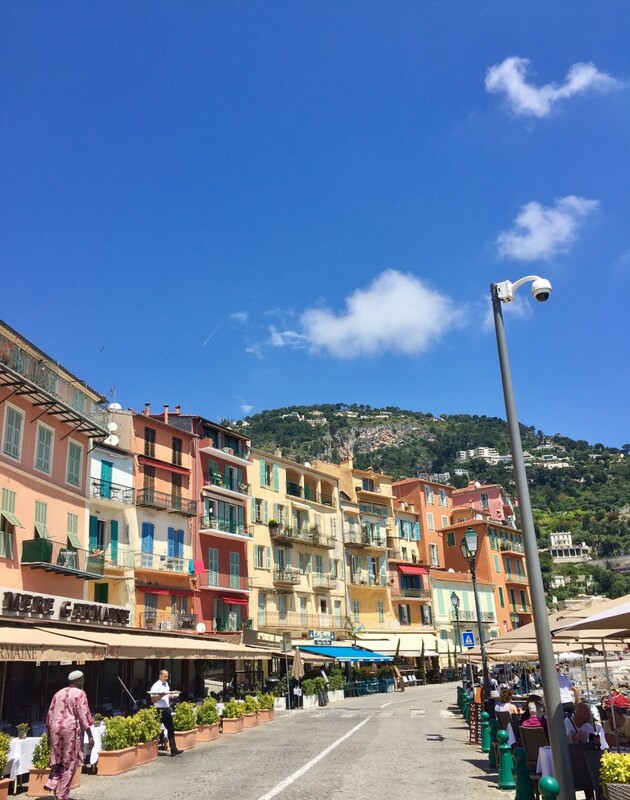 Villefranche-sur-Mer is our special, happy place with my husband, we have visited quite a few times. 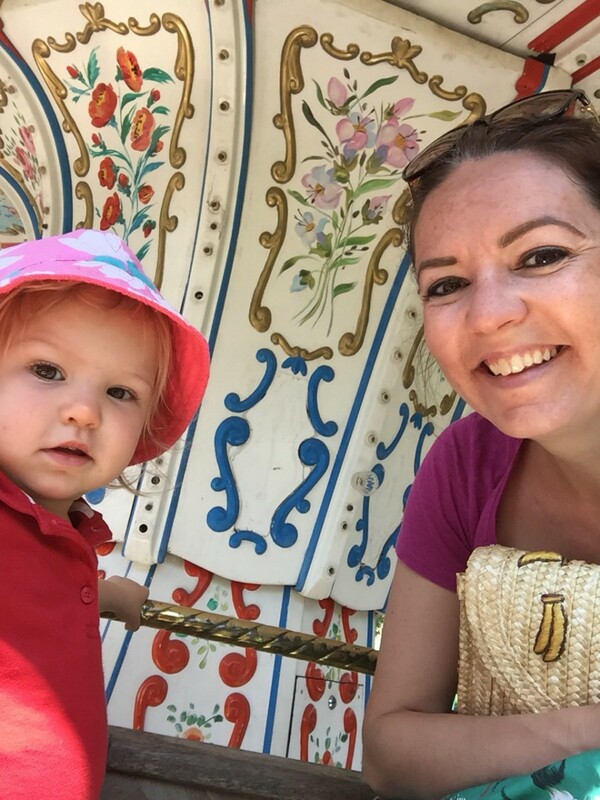 This year we took both children which meant we couldn’t just lie on the beach sipping cocktails or eating out in the best French restaurants as we did before. 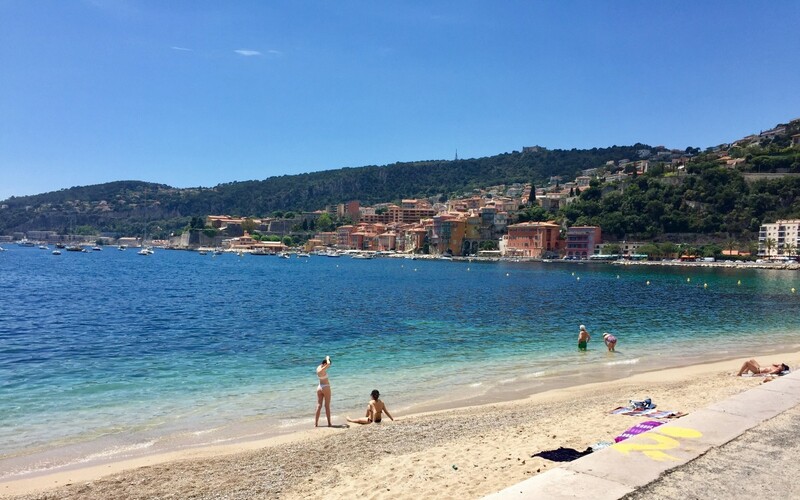 But our Villefranche did not disappoint and we had a lovely time. 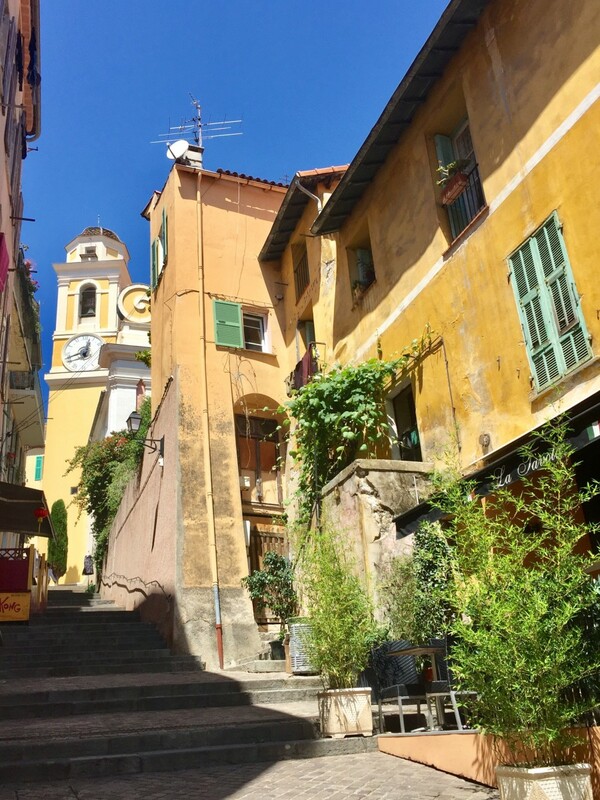 Villefranche-sur-Mer is a charming, old fishing village on the on Cote d’Azur, in between Nice and Monte Carlo. 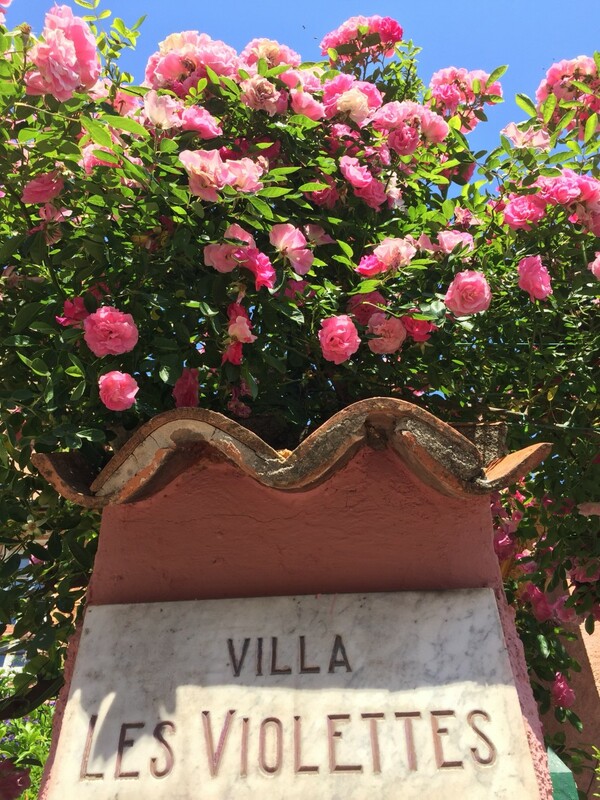 This is the real Riviera around here, the heart of the 20th century glam, beach and film culture. 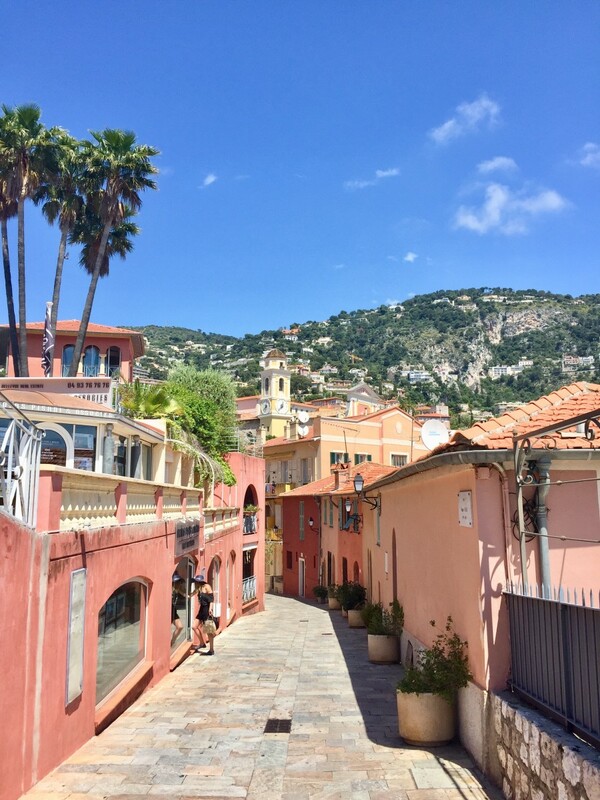 It has a small, but beautiful harbour, a citadel and a restaurant and tiny shops filled old town, which dates from the 12th and 13th centuries. 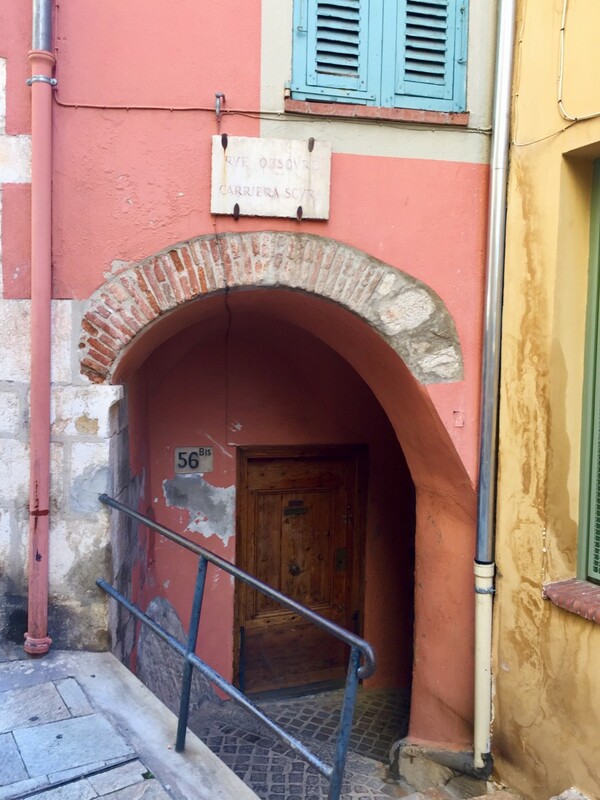 The Rue Obscure is very particular place to visit in the old town, it’s a covered and arcaded street originated from the 13th Century and it was built to protect the villagers. 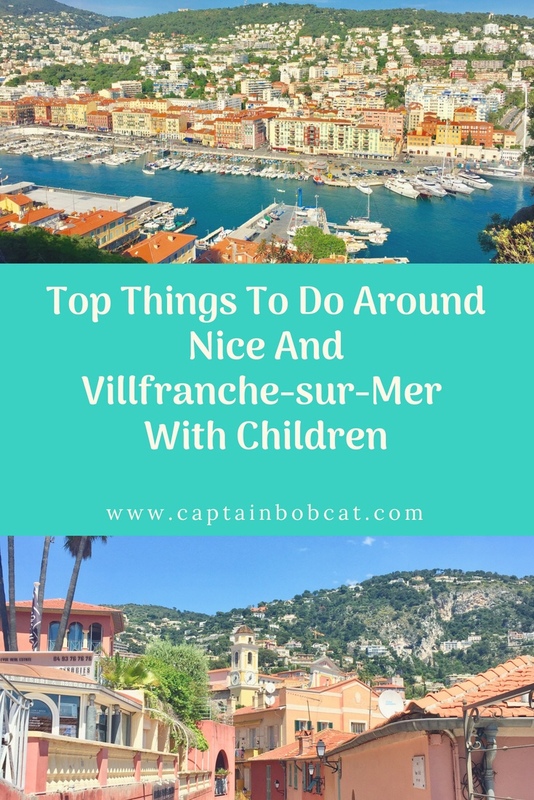 Lot’s of historic buildings, all the natural beauty, French cuisine and wine to enjoy – but what about the kids? 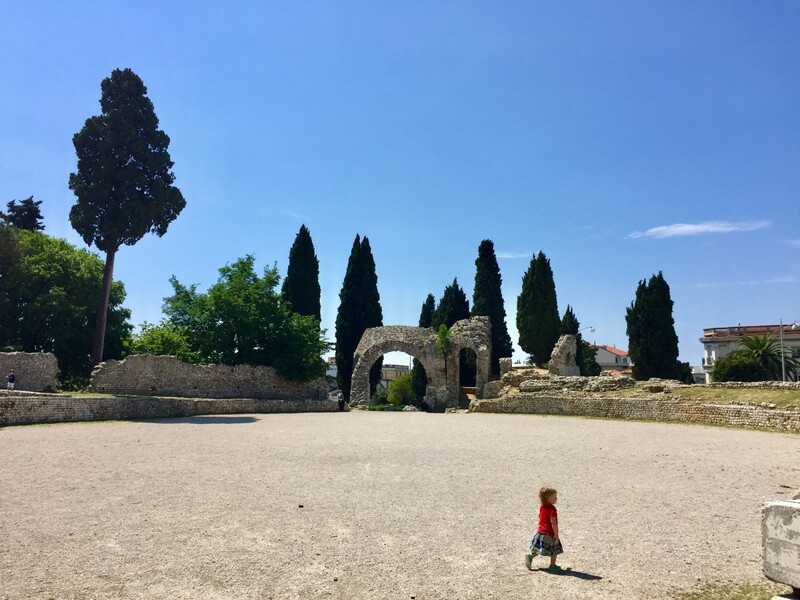 We’ve found some places around here which was great fun for both the children and the grown ups. 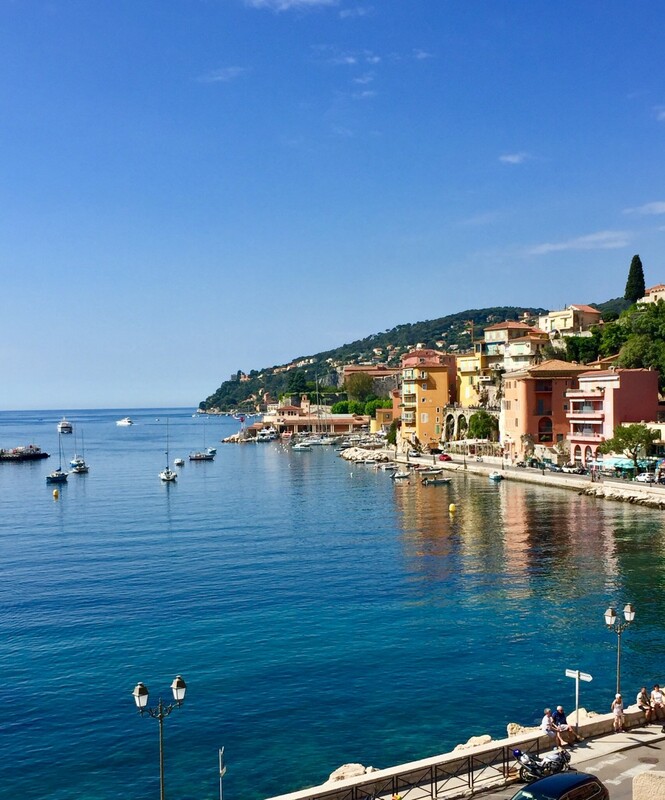 Villefranche-sur-Mer is also a better option to stay , at least that’s what we prefer. 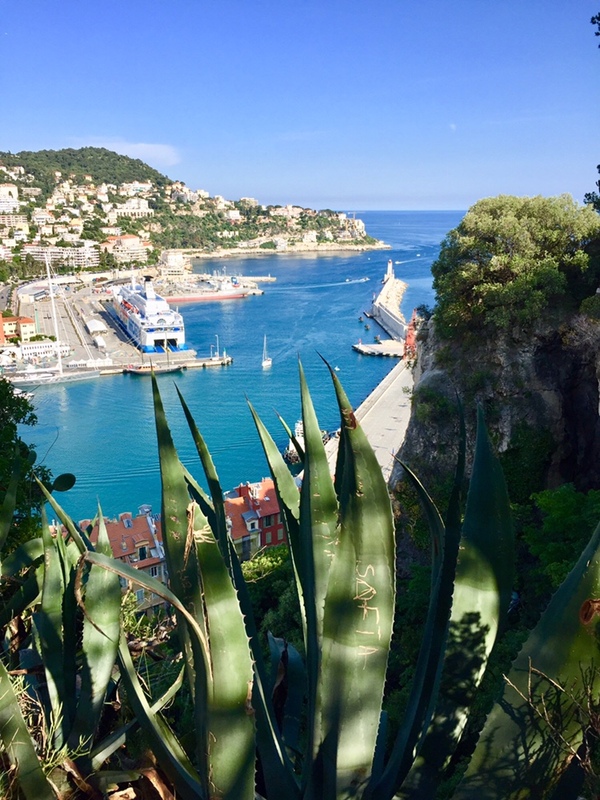 Nice is lovely, but we always stay in Hotel Le Provencal Villefranche-sur-Mer. Of course, this is an obvious thing to do, in the summer. 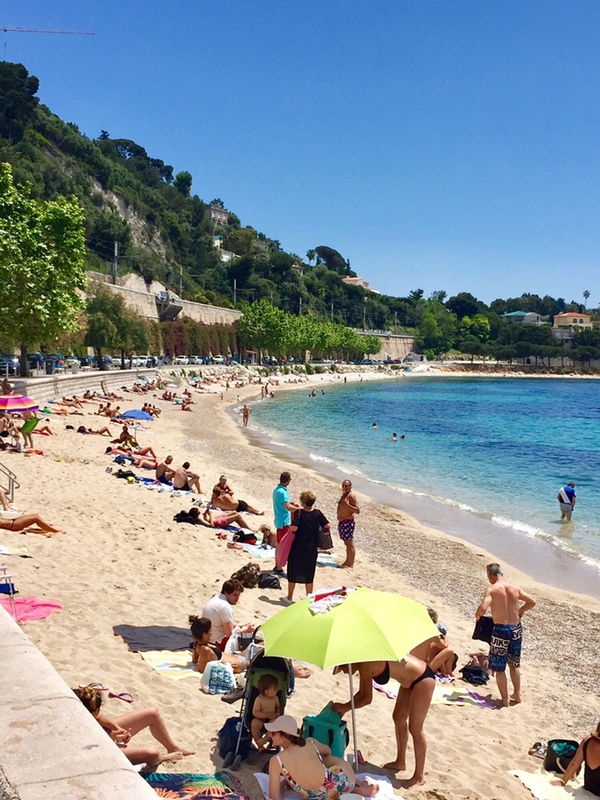 Villefranche-sur-Mer has two beaches: the main, Plage des Mariniers (sand) and Plage de la Darse (pebbles). We tried both as on one occasion we stayed right by the latter and I really have no preference. The water is clear, shallow, warms up early in the season (around May) so it’s perfect for children. They are both sheltered because of their situation in the bay. The main beach can get quite busy though. Overlooking Nice Bay, protected by the hills and the sea it’s probably the most picturesque public park I’ve ever seen. 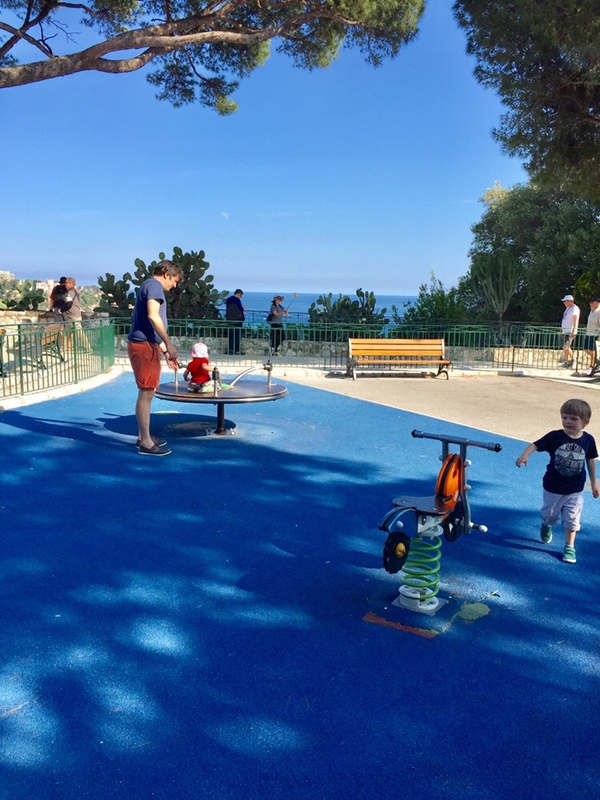 Your young children probably won’t be amazed by the breathtaking panorama like you, but they will surely enjoy the little train ride up to the top of the hill (or the free elevator) and the great playground right on the top. And an ice cream in the hill top cafe. Also, there are lot’s of trees which protects from the sun and the heat. 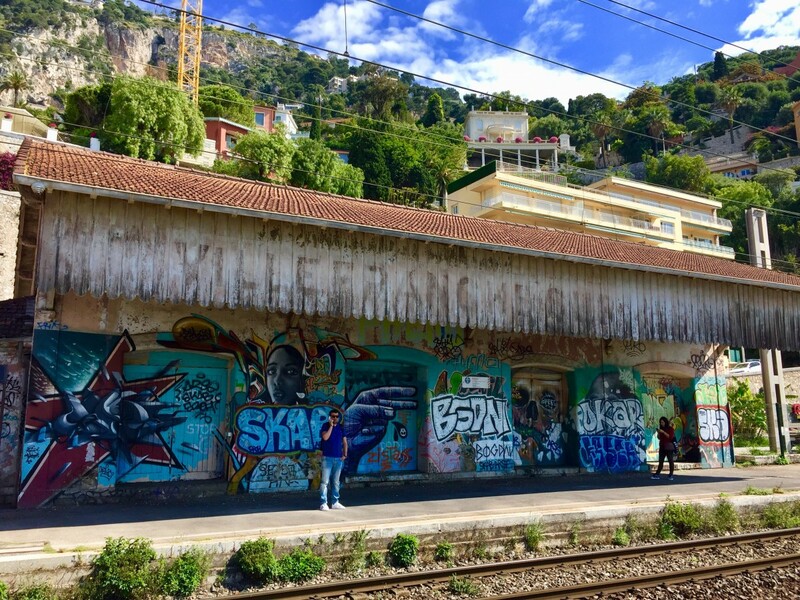 The miniature train also a fantastic way to do some sightseeing in Nice. 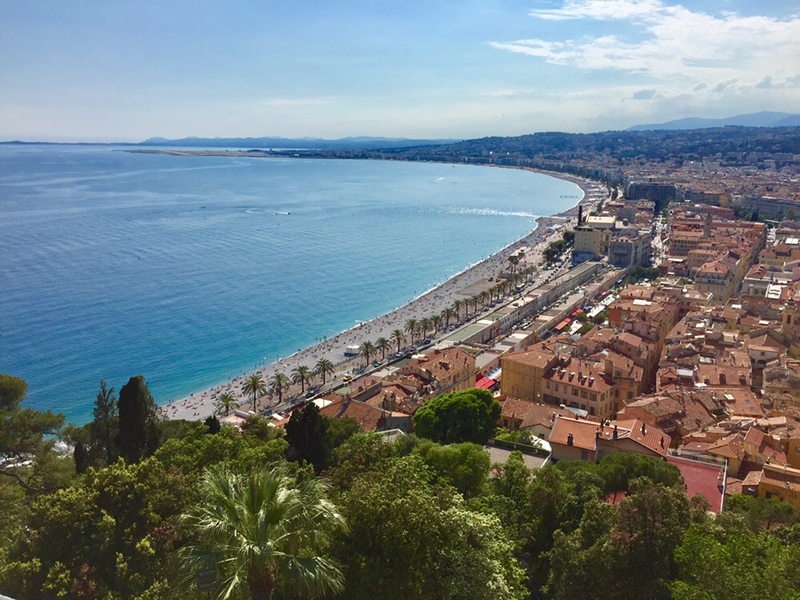 You’ll see the Promenade des Anglais, the Flower Market, Massena Square, the Old Town and the last stop is the Castle Hill. It’s a 45 minutes long ride and cost 10 € for adults and 5 € for children. 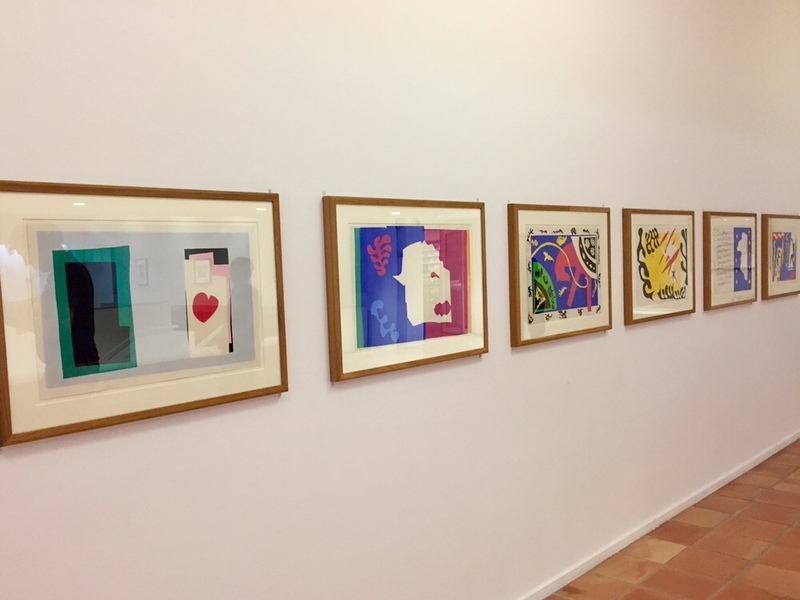 This is not as crazy as it sounds: taking small children to museum, because in Musee Matisse, the painter’s artworks are really compatible with children’s imagination. All the bold colours and shapes are a fantastic way to explore and talk about art and awaken their imagination. 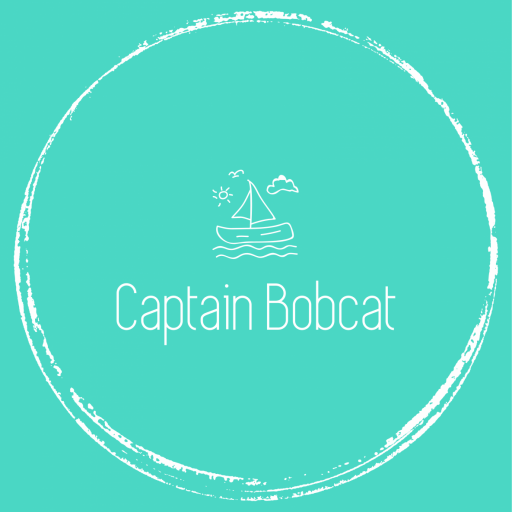 All of us fell in love with this museum – and surprisingly Bobcat enjoyed it the most. 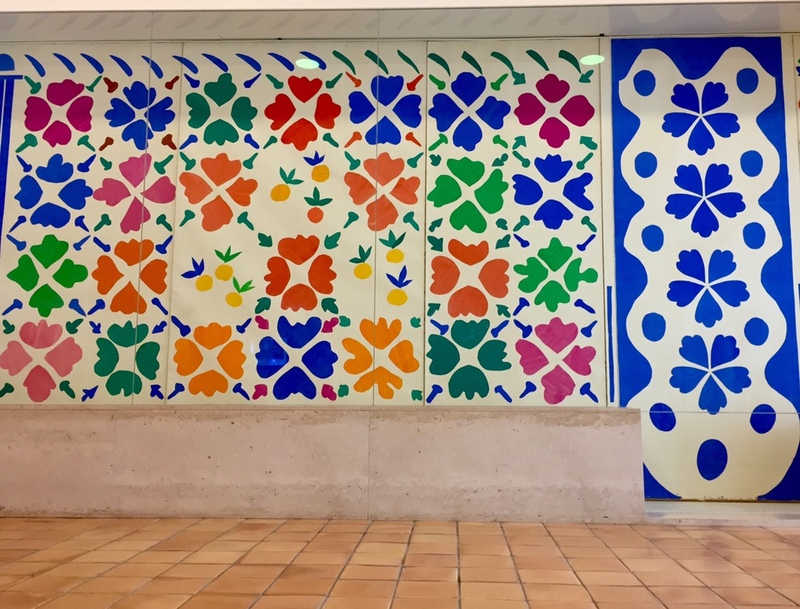 We walked around – there are a lot of places to sit down and just chill too – and he just kept telling me what he sees in the shapes and colours: a clover! seaweed! a dog! 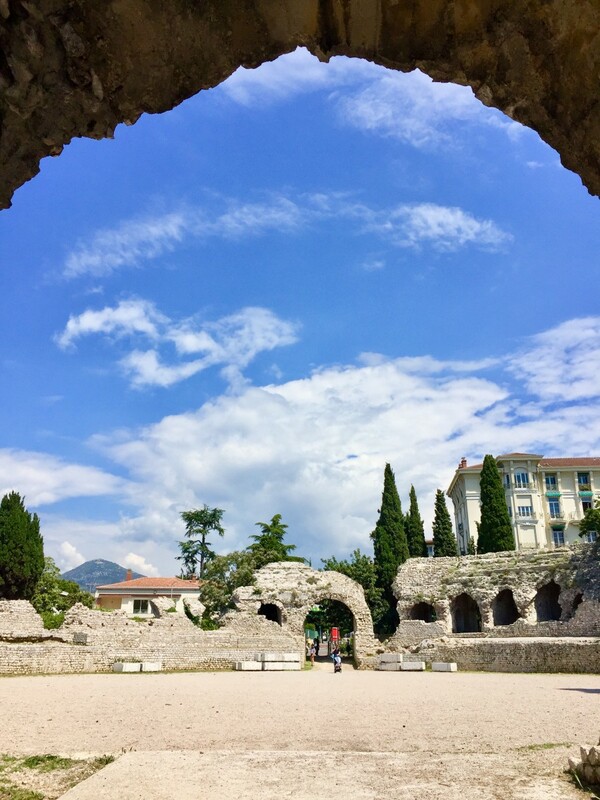 The museum is located in the Cimiez district of Nice, and there are fantastic Roman Ruins right next door: including an arena, amphitheatre, thermal baths, and paleochristian basilica. Great climbing and running around. 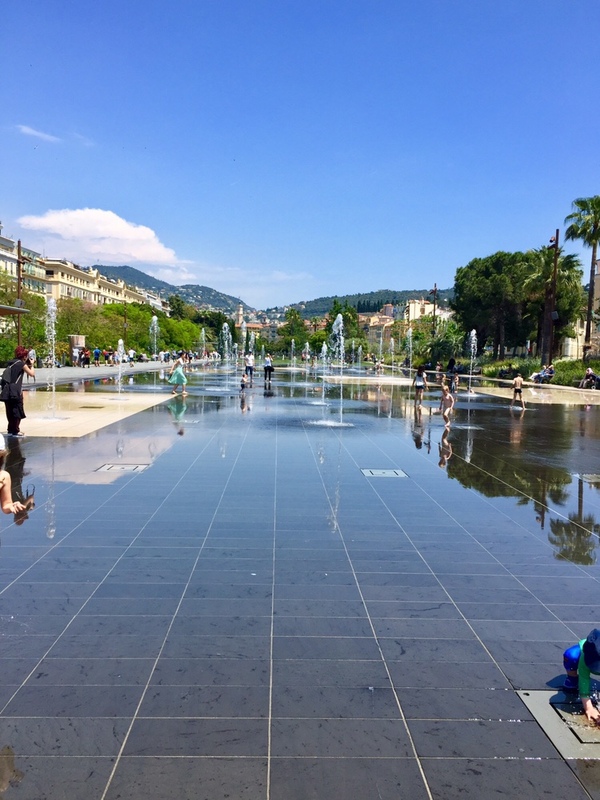 In the centre of Nice, there’s this newly built, enormous surface covered with water jet fountains – a favourite place for the local children in the summer. So don’t forget to take towels and changing clothes! 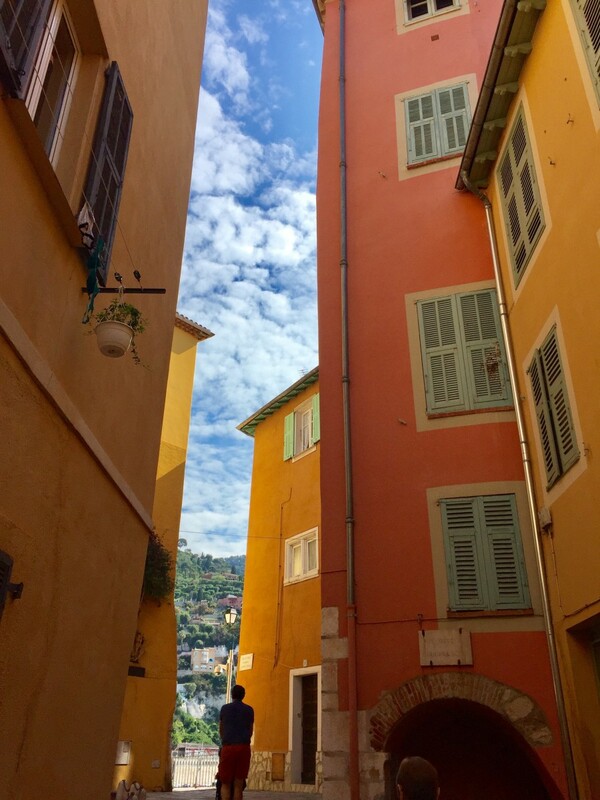 Both Nice and Villefranche-sur-Mer is perfect for long walks and strolling around. 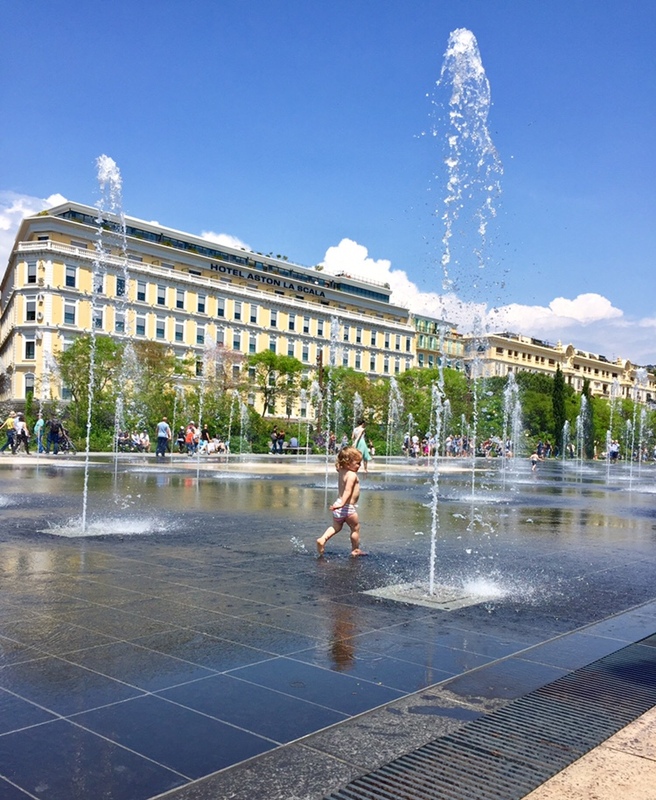 The promenade, the seaside, the old town are all beautiful and children-friendly walks. 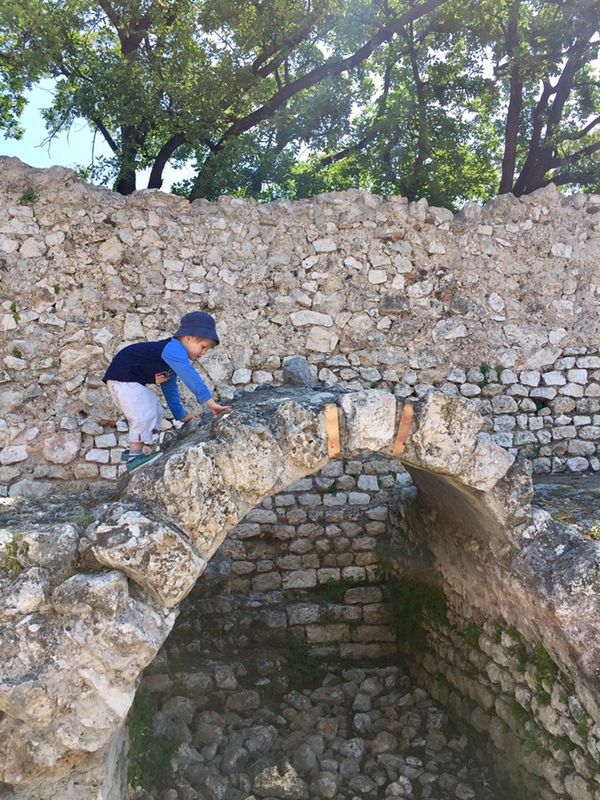 Even if you don’t appreciate the steps everywhere (not very buggy-friendly, but no old towns are really), the children definitely will! 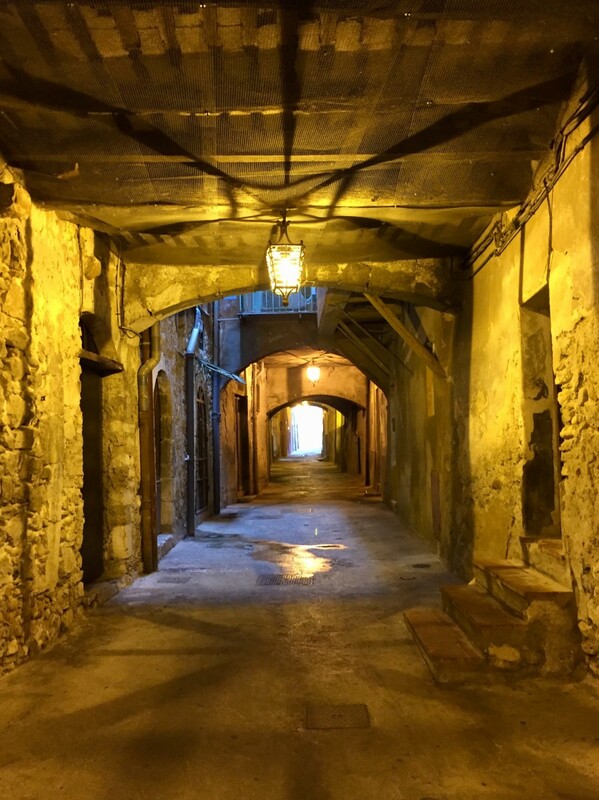 And again, the Rue Obscure! Both the kids found it equally spooky and fun. 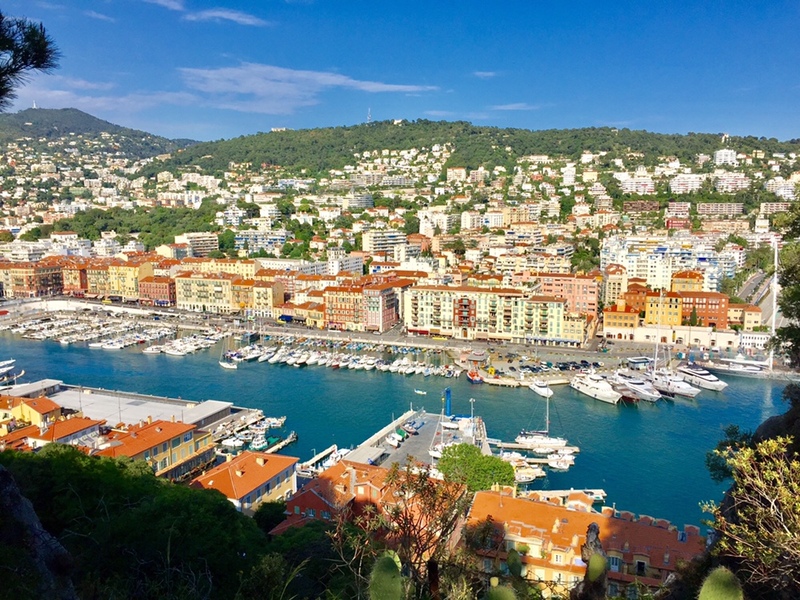 Throughout the year there are lots of festivals are being held both in Villefranche-sur-Mer and Nice. 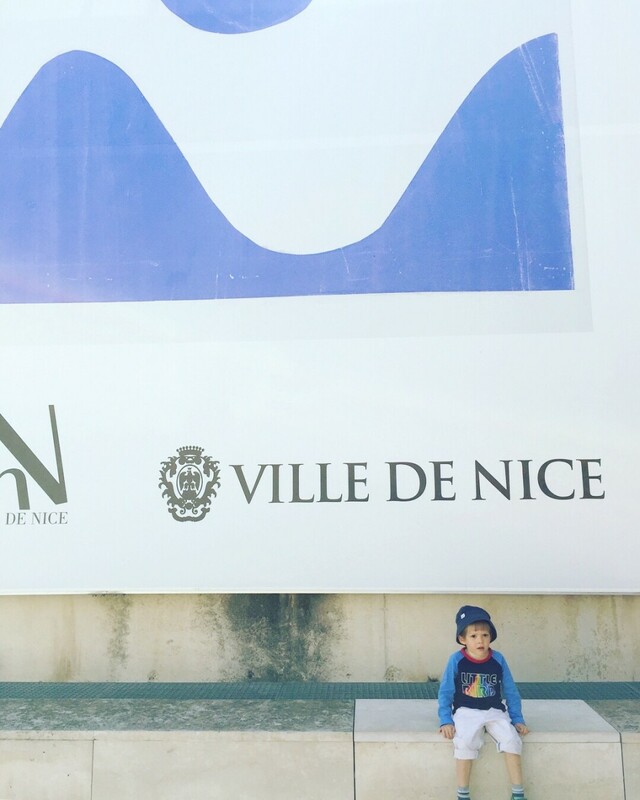 Free concerts, fétes, cheese and macaroons with installations and entertainment for the children too. 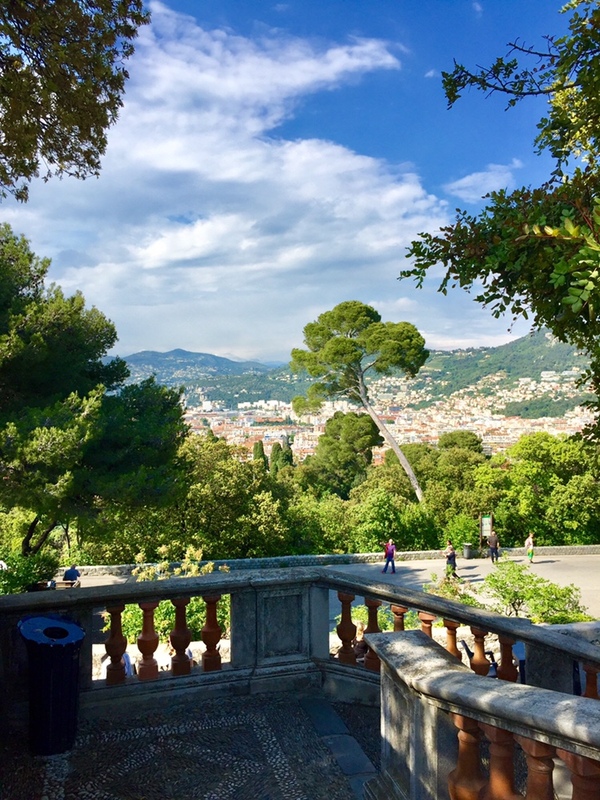 My husband and I had a whistle stop tour of the Riviera on our honeymoon, a tour around Europe. It sounds like we should visit again to get the proper experience! What was your favorite thing to do? I can really see why it has a special place in your memories, it looks andsolutely idyllic and peaceful. I love how quick it is to get to nice. You had me at ‘free macaroons’! Sounds like both children and adults alike could have an enjoyable time here. You make the whole place look and sound amazing. 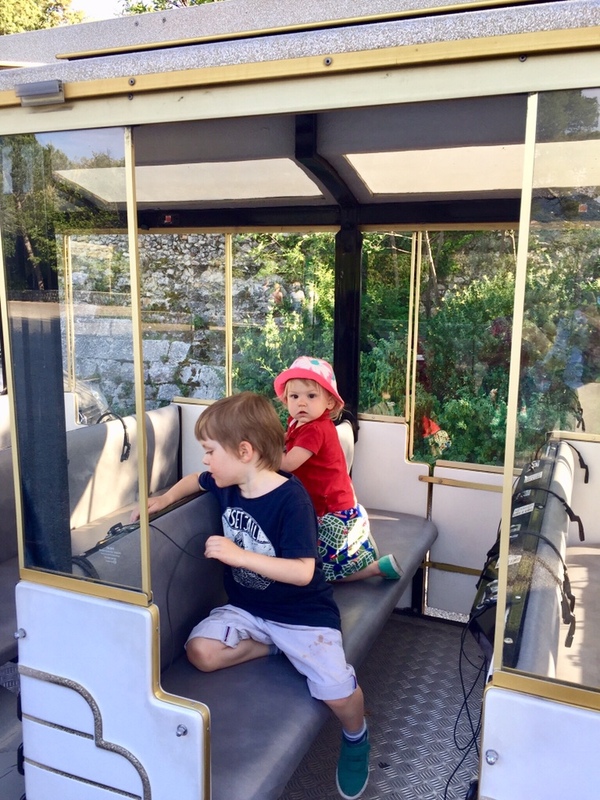 The miniature train in particular looks great for kids. it looks gorgeous! and the free macaroons sounds ace!! the beach looks so beautiful – it must be packed in this weather!